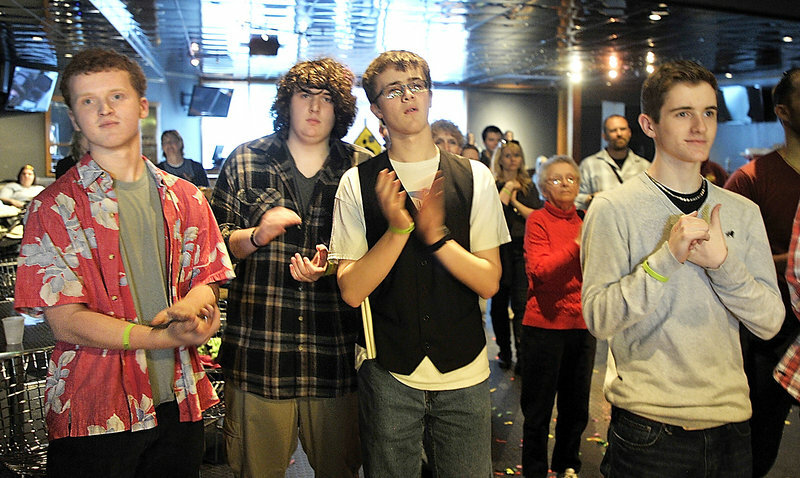 The local band Rupture the Fish performs for cash and prizes in the finals of the MAMM Slam teen band competition. PORTLAND – Inside the Asylum nightclub, blue and green lights flash while a band called Rupture the Fish shakes the walls with fast, punky rock music that sounds like it might make good accompaniment for bouncing on a pogo stick. “When the sun goes down/ Senior riot on the town/ We’re gonna burn this sucker to the ground,” the lead singer screams, his words racing out of his mouth. In the middle of the dance floor, Joanne Nason of Scarborough steps lightly and swings her arms. A few feet away, Lorraine Jones of Saco sways a bit more gently. Both are there to shout and clap and cheer for Rupture the Fish’s clean-cut drummer. After playing their half-hour set — and the only six songs they know together as a band — the four teenagers in Rupture the Fish get ready for a three-hour wait. 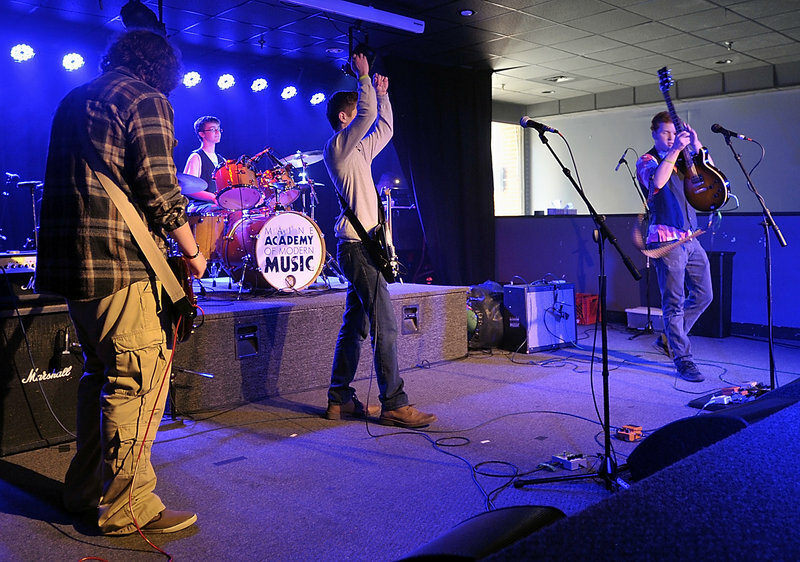 They now have to sit back and watch their competitors in the final round of a statewide teen band competition called MAMM Slam, named for the Maine Academy of Modern Music in Portland. 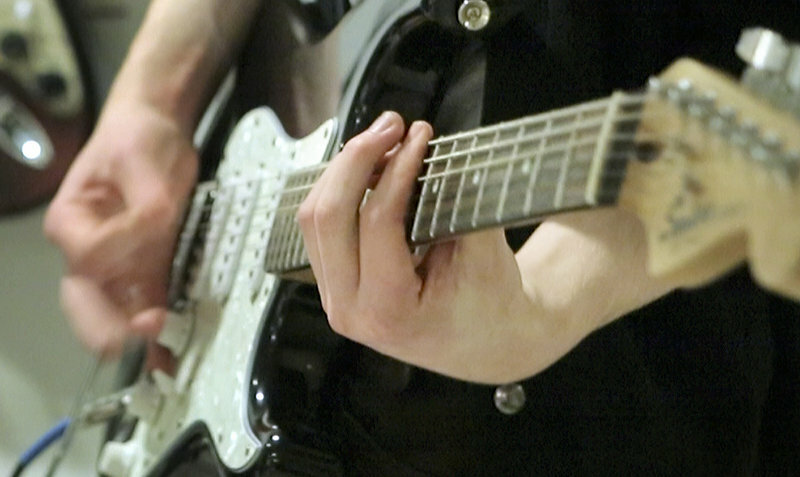 At stake are these kids’ rock ‘n’ roll dreams and the stuff that can make them real. Specifically, the prizes being offered in the MAMM Slam contest include $1,000 cash, a weekend of studio recording time, marketing and graphic design consultations, and help in getting gigs, radio airplay and TV appearances. Being in a rock band has been a rite of passage for generations of music-loving teenagers, but it’s a world few beyond them and their families get to see close up. Kids around the world get inspired by their musical heroes and try to sound like them, to find the same passion. Many dream of rock stardom, but most will find less glamorous pursuits, ranging from college to jobs to having children. But for at least this one Saturday in April, the guys in Rupture the Fish — and all the other bands that shared the stage with them — are rock stars. Teen rock bands of the past were often relegated to garages and basements out of earshot of parents. But for the four-year-old MAMM Slam competition — a teen rock fest turned into a family-friendly spectator sport — the guys in Rupture the Fish not only brought their instruments, they brought uncles, aunts, parents, grandparents, little sisters and kid brothers. Add friends, and the band easily has 50 people in its corner. Six bands are scheduled to compete, and all bring family and friends. The members of Rupture the Fish and their family entourages arrive before noon, with some family members driving up from Massachusetts and Rhode Island. And they don’t leave until the winners are announced around 4:30 p.m.
At one point, the four members of the band are hanging out on the sidewalk in front of the club with Ben’s 8-year-old brother, Connor. 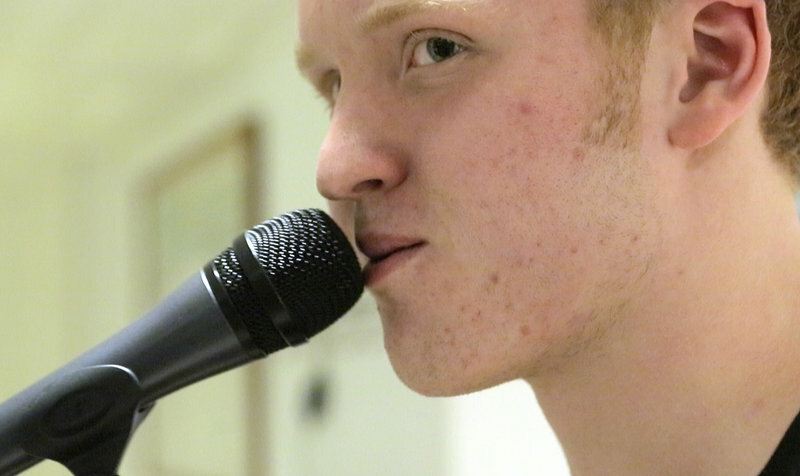 Scott Ralston, 16, the band’s lead vocalist and one of two guitarists, tells his bandmates he could see a future in rock for Connor. “I can definitely see Connor doing some thrash metal,” he says. On a Tuesday afternoon before the finals at Scott’s South Portland home, Mike Nason sits in the family room with Kay McKusick Ralston as their sons, Ben and Scott, practice for the MAMM Slam in the basement with their Rupture the Fish bandmates. The floor vibrates a little as bassist Spencer Teachout plays a rumbling bass line for one of the band’s funkier numbers, which might cause people of a certain age to think of an Ohio Players tune circa 1976. But most of the band’s other songs are in the punk genre, with quick riffs, a percussive drive and screaming lyrics. Nason, a Coca-Cola delivery man who lives in Biddeford, waits to give Ben a ride home once band practice is over. 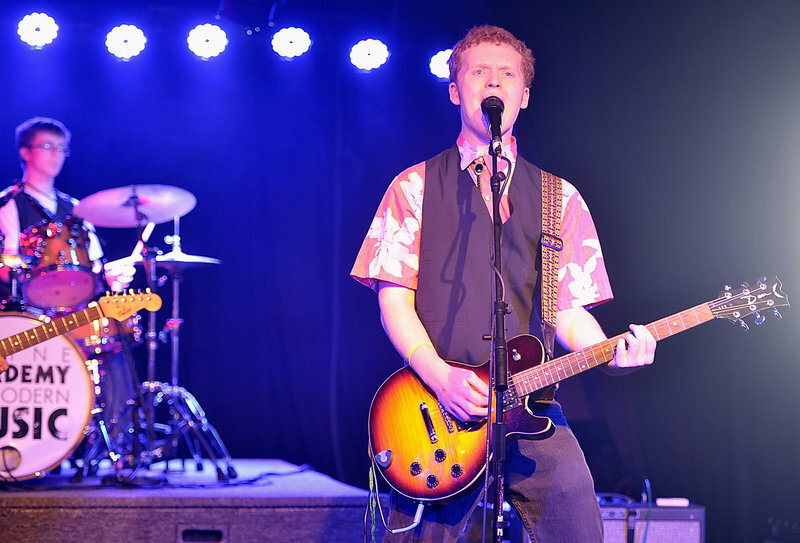 Nason and McKusick Ralston know each other well, because their sons have been in various rock bands together for about three years. And the boys often need rides to practice. Scott and Ben originally met through MAMM, which founder Jeff Shaw describes as a “school of rock” where young musicians come for lessons, for summer band camps and to join bands. Weekly lessons run about $100 a month, and camps can be $300 a week. Like Little League, MAMM takes kids who want to play and assigns them to a team — or in this case, a band. They’re given a regular practice time at MAMM, for which they’re billed, and tutored both in music and the art of running and marketing a band. “I think it’s great what they’re learning, the teamwork that’s involved,” says McKusick Ralston, Scott’s mother. Kay and her husband, Matt Ralston, not only let the band practice at their house but go to the shows, and have taken Scott to see some of his favorite bands, including Green Day. Down in the basement, Rupture the Fish goes over songs for the MAMM Slam finals. All in stocking feet (they left their shoes upstairs to avoid tracking in dirt), they rip through some tunes with Scott singing and throwing in a maniacal laugh here and there, bouncing to the beat. Above his head is a suspicious-looking tear in the ceiling, but Scott says it’s not collateral band damage. “It was my sister and I throwing balls around,” he says. 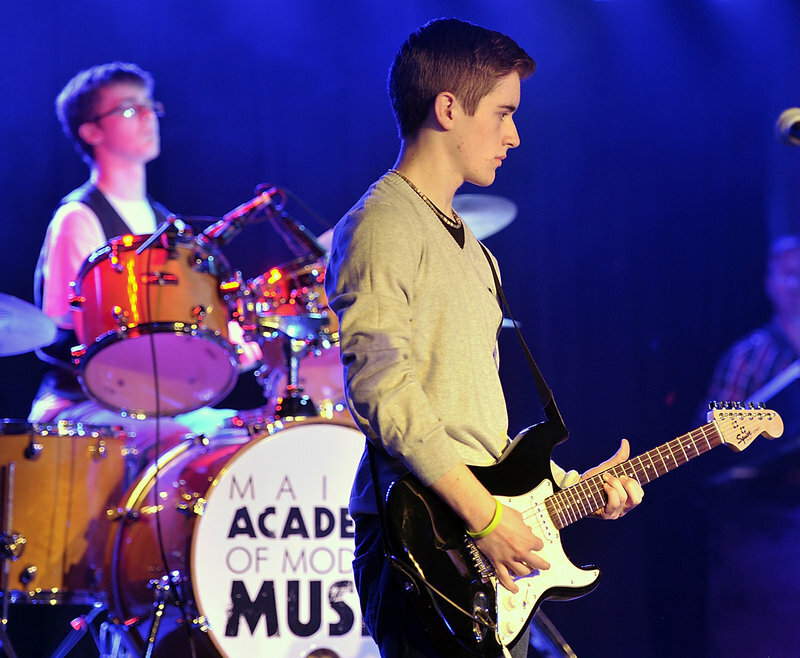 Scott, a student at Waynflete School in Portland, met Ben, who goes to Biddeford High School, through MAMM, and they have been friends and bandmates ever since. Earlier this year, they contacted MAMM about finding some cohorts for their musical adventure. They got hooked up with guitarists Eamon Kelley, 15, from Cape Elizabeth High School, and Spencer Teachout, 16, from Scarborough High. Spencer switched to bass — because they needed a bassist — and the band started playing together in February. Just a little more than a month later, they found themselves in the preliminary rounds of MAMM Slam at the Big Easy nightclub in Portland, where they did well enough to move on to the finals at Asylum. The contest is co-sponsored by MaineToday Media, publisher of the Maine Sunday Telegram. The band’s name had come to Scott before the group was formed. One summer while frolicking in his grandparents’ pool, he witnessed a fish-shaped chlorine dispenser rupture because of all the frolicking. He wrote down the words “rupture the fish” soon after, figuring they would some day make a good band name. As they practice in the basement, only Scott sings. “I only have one microphone,” he says. He’s being modest — Scott has spent several years as a member of the Boy Singers of Maine, a nonprofit boys choir that has performed around the world, including at the White House. As the band practices, each musician throws out suggestions. Spencer asks about a bass line and plucks it out. Eamon asks if he is too loud. But mostly, they run through the six original songs that make up their entire catalog. They have a half hour to fill at MAMM Slam, so they figure they’ll need all six. That’s not to say all the songs were just thrown together with nonsensical lyrics. Like all teenagers, the guys in Rupture the Fish definitely have something to say. When the big day of the MAMM Slam finals arrives, Scott has a 90-minute Boy Singers of Maine rehearsal that morning. He arrives at Asylum before noon and greets his bandmates holding a garbage bag full of balloons. “I made some blue fins (from paper), and we can stick them to the balloons and have people pop them,” he says. Sunlight streams into Asylum as the band members bring in their instruments. Spencer’s mother, Terrie Tilton, sets up a table to sell “Rupture the Fish” T-shirts and wristbands. While the first act plays, Rupture the Fish joins the crowd to watch. At one point, Scott’s mother walks around to ask which of the band members and their friends want sodas. She counts a dozen or so with waves of her hand, then goes into the adjacent sports bar to get the drinks. A few minutes before going on, the guys are in the back, holding their instruments. Their MAMM “ensemble” teacher, Kelly Bryand, comes over to offer words of encouragement. Herb Ivy — known as “The Captain” when he hosts the morning show on WBLM radio — introduces Rupture the Fish, and they take the stage. Scott yells something that sounds a little like “1,2,3,4!” and they launch into their set with “Lighter Fluid and Denture Cream.” After the song, Scott explains that the lyrics are about “senior citizens who like to burn things,” and laughs a little. Ben’s brother Connor sets himself up as close to the stage as possible, with arms and chin actually on it, and stays there for the entire 30-minute set. At one point, the band starts a song slowly before Scott abruptly breaks it off. “Just kidding. OK, everybody laugh so it’s not awkward,” he says of the miscue. Through much of the show, Scott’s dad, Matt, watches with arms folded and a big smile on is face. He’s a rock fan — a Green Day fan — but he’s also a radiologist. So as the band plays, both he and his wife wear special earplugs that are designed to protect their hearing while letting Rupture the Fish’s rock filter through. After their set, the guys get pats on the back and hugs from family members. Ben goes out to lunch with some of his relatives, while the others hang around Asylum and listen to the other bands, including The Stolen Mural and Beware of Pedestrians. Both sound like formidable competition. The members of Rupture the Fish had talked a few days earlier about not worrying too much about the competitive aspect of MAMM Slam, evoking a “just happy to be here” attitude. But now, after the adrenaline rush of playing on Asylum’s pro-sized stage before a hundred or more people, there’s an edge to their attitude. Happy to be here, yes. But the competitive juices are flowing, too. “It’s about 50-50 for me right now,” says Spencer, on whether he wants to win or is just happy with the experience. After all six teen bands play (and two are disqualified for not having all their registered members), there is yet another set by The Fogcutters, a local big band made up of adults. By this time, Eamon and Scott have found comfy chairs way in the back and put their feet on a table as they thumb around on their smart phones. Ben and Spencer sit with family. When it seems The Fogcutters’ set is nearly over, Eamon, Scott, Spencer and Ben quietly assemble together in the middle of the crowd, away from family. They are soon joined by Connor. Ben’s arms go out in a half shrug, half exclamation of relief. “I thought it was going to be Stolen Mural,” he says. After getting more pats and hugs from family members and chatting with some other bands, the guys start heading for the door. Spencer says he thought Beware of Pedestrians would win, as they really seemed to be polished and practiced. Which they were — they were in the finals last year, and have known each other a long time. Two of the members are cousins. Rupture the Fish may be back next year, the guys say. They definitely want to stay together as a band. But for now, moments after watching another band beat them, they just want to go home and zone out. Their next gig is just a few hours away, at Cape Elizabeth High School.